Owner/Chef Carl Osburn Chats with a Couple Carl’s Classic Cafe took a turn for the better, by recently segueing from serving breakfast and BBQ at lunch at Carl's Classic, to now calling itself “Black Eyed Pig,” serving BBQ at lunch and dinner. It’s a popular central Naples spot with comfortable setting, big portions and tasty food. The down home setting is right for chowing down BBQ, with fajita iron skillets at one end, and iced tea, a TV and cold drinks at the other end, with the counter and kitchen ahead as you come up the few stairs. It can be tight quarters at lunch and dinner; Much of the business is takeout. I ordered the Black Eyed Sampler plate “to go”, a choice of 4 items for $11, and was served a very generous portion, nicely arranged in a styrofoam container. The BBQ chicken is my favorite. The requested thigh and drumstick are meaty, succulently juicy and tender with a good taste of smoke that doesn’t linger too long. Next favorite is the pulled pork; tender and nicely smoked- not too dry or wet. Plain or dipped in Carl’s wonderful BBQ sauce, it's good hits the spot. Sure I’ve had some better, and I’ve had a lot more that didn’t measure up. There’s a hotter BBQ sauce with jalapenos, try both and see. The ribs are cooked till just short of falling off the bone. They are meaty enough without excess fat; this particular late hour batch was not as juicy as other ribs I’ve had-I’d come back for another sample-different spots in a cooker can make a difference. The ribs are nicely smoked, and to those that count, the smoker ring is a few millimeters in depth, for what that’s worth. The rub is light, and complements the pork taste. Like the pulled pork, ribs with a touch of the BBQ sauce are enjoyable, and the price can’t be beat. The brisket is a good portion, however it’s lean, not juicy as what I’ve had in Sonny Bryan’s and other Texas spots, where beef, and especially brisket are synonymous with BBQ. Brisket, with its long cooking time, is the hardest BBQ meat to get "right." Best part are the daily specials with cole slaw or fries, 11-3, M-Friday only. The Black Eyed Cuban has smoked pork, ham mustard and pickle for $7, and Monday is Mojo pork or smoked chicken quarter, Tuesday and Thursday are Southern Fried Chicken or Meatloaf, Weds is roast turkey or roast pork loin, and Friday is fried fish or BBQ chicken. There’s cold beer and house wine is $3.75 wine, with wine specials. The Pig is open 11-8 pm Mon-Friday, and Saturday noon till 8 pm. For the price, the tasty food and large portions pack people in. Competition? They go well against Michelbob's sweeter style on taste and price, and Brown Bag is in its own funky niche. In Lee County, I like Fort Myers’ Lee Roy Selmon’s, and Fort Myers’ Emmett Todd’s BBQ and Course are very good, cooking and selling ribs and chicken that truly set the bar high for Collier and Lee County “Q”. 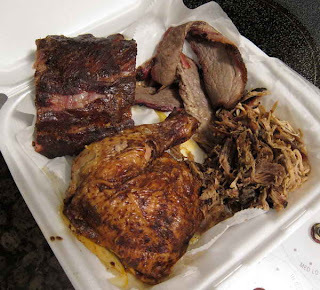 Brown Eyed Pig is appreciated for serving their “Q” without sauce to honestly savor the meat. Other spots use sauces to overwhelm or disguise the meat’s taste. I’d put Carl Osburn’s St Louis style sauce up against anyone’s sauce around. His BBQ is a feather in the cap for Collier County. I'll be back. 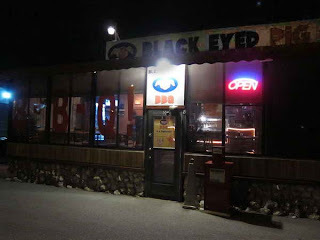 Congrats to Carl and the Black Eyed Pig on a fantastic review. I will make a point to visit the next time I am in Naples!